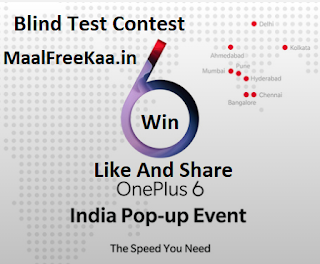 With the OnePlus 6, we'll let the images do the talking.The best in the world the OnePlus 6, iPhone X, Samsung Galaxy S9 and Google Pixel 2 will be put to the ultimate blind test. Vote for the best photo in today's Architecture Photo Blind Test Tune in to the Amazon India Fast AF sale from the 13th to the 16th of May and reserve the OnePlus 6 for yourself before anyone else does, globally. MaalFreeKaa.in No. 1 Cashback & Offer Website providing best deal and freebie offer stay with us and grab awesome deal only here. Website in News Media About All Online e-Commerce News Update. You Grab Daily Awesome Freebie Product or Prize When you Play our Publish Online Giveaway and Free Sample Claim. Now We Leading Page in IPL 2018 Contest You Can Play IPL Contest and Get Free Official IPL Team Jerseys, T-Shirt IPL Match Tickets, Top 5 IPL Player Ranking And Much More. The OnePlus 6 is your ticket to the Android P Beta! Find out how you can gain exclusive access to Android's latest flavor. Vote for the best photo to get a chance to draw. 1. The Blind Test is divided into four categories. Participants can vote for the best images and take part in a lucky draw. 2. Each user will be given at the most 5 chances to participate in the lucky draw. 1 chance each can be earned by voting while 1 chance is given by default. 3. Users can use their available lucky draw chances at any given point of time between 11th May and 14th May, 2018. 4. All lucky draw vouchers are valid until 30th June. Post this date, all vouchers will expire. 5. The lucky draw entitles participants to vouchers (automatically allotted by the system) to be redeemed at OnePlus Website. 1. 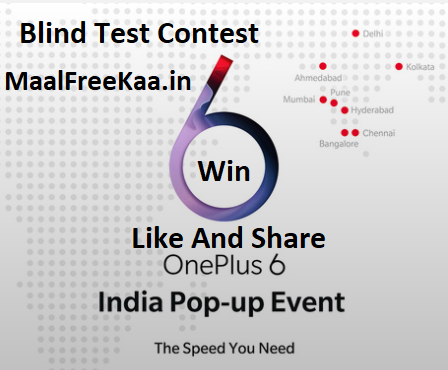 Starting 11th May until 14th May 2018, share the Blind Test contest details on Facebook and Twitter with your friends. The top 3 users on our leaderboard each takes home a OnePlus 6. 2. The top 3 users from our leaderboard can redeem their vouchers against select variants of the OnePlus 6 from oneplus.in, once sales commence. 3. The contest will be closely monitored. Any users found cheating will immediately forfeit any points / rewards accumulated. 4. In the event of a tie between more than two users for 3rd place, the prize will be forfeited. 5. Users can only move up in leaderboard if the invited friend participate in the Blind Test. 6. The rank is updated twice everyday (9:30 am IST and 9:30 pm IST) and ends on May 14th at 11:59 pm IST.